The question “what’s under the big white tent located along Ohio 66 between Minster and New Bremen?” has been asked frequently since Celina Tent employees erected the 80-by-140-foot structure in mid-December. According to Sean Dorsten, vice president of general contractor H.A. Dorsten Inc. in Minster, the tent provides protection from the elements as subcontractors complete installation of underground plumbing and electrical conduit at the site of the new Minster Dental Center, shown in previous picture. On Tuesday, Gary Niekamp backfilled one of numerous trenches containing underground components. Part of the tent will come down in the coming weeks to facilitate pouring of the concrete floor. 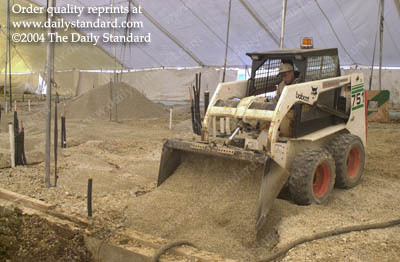 Given the likelihood of inclement weather during late winter and early spring, Dorsten said initial framing operations also could take place beneath the big top. A September target date has been set for the completion of the center owned by Drs. Shawn Sharp and James Meiring.